Nekita is living up to her name. The name Nekita means victory or victorious. This Nekita is just that! On March 9th Nekita arrived at our shelter with a badly broken leg. X-rays revealed she had an older fracture that was healing. Despite this she had a difficult time using that leg. After nearly 8 weeks of kennel rest, her behavior started to deteriorate and her leg still had not healed. Our veterinary team, with input from an outside clinic, felt that it was in the best interest of Nekita to amputate the leg. We elected to send her into a foster home for a few weeks prior to the amputation to allow her to decompress and evaluate her behavior outside of the shelter. Remarkably, while in a foster home, her leg managed to finally heal. The swelling went down and she began to use it again. After 4 months, Nekita saved her leg; she was victorious. Now, she is hoping to steal YOUR heart! Nekita is about three years old. She is a spayed female and from her time in a foster home, here is what we have learned: Nekita is house trained and crate trained. She sleeps throughout the night with no problems. She is very quiet when left alone and will just relax. She walks well on a leash and responds to her name. She LOVES to play with toys and her first stop is usually the toy box. She will pick out a toy and carry it with her onto the next adventure. She rides amazingly well in the car and is curious while out on adventures. Nekita is easy to please. She has been working on her basic manners but could use ongoing practice (can't we all). Nekita is very excitable and wants to be a part of the party. Nekita: smart, silly, sometimes serious BUT really ready for her forever home! Does Nekita sound like the dog for you? Miss Nekita has a bright smile and a big heart. She never has a bad day and would like to share her happy go lucky outlook on life with you. 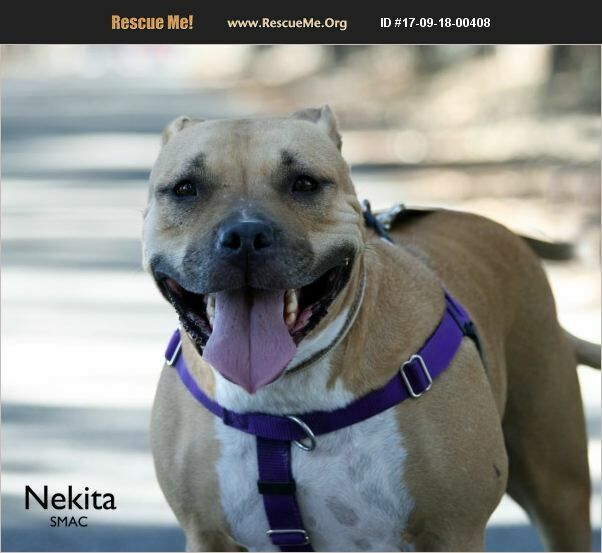 Nekita enjoys going on walks, learning new tricks, giving hugs and being out and about. If you think Nekita is just the 4 pawed partner you were looking for go by and meet her at the SM Animal Center 548 W. Foster Rd SM. NEKITA - ID#A412093.